With years of experience providing Texas business consulting services, the staff of THEY improv bring their skills to solve your needs. Whether you are looking for help in achieving corporate culture change, merger or acquisition assimilation, simple team building workshops, leadership training, employee recognition, bonding, meetings and incentives or skills training, the professionals at THEY improv can assist you in unique ways. With major centers of business such as Houston, Dallas, Austin, Galveston and many others, there is no shortage of major companies needing to improve their services. Likewise, through the rest of the Lone Star State, there are major hubs servicing the oil industry, natural gas, farming and a variety of other industries that need help away from these larger centers. Improvisational techniques can help increase the efficiency of your business, help your adjustment to ever-changing market conditions, smooth transitions in administration, enhance corporate presentations and better enable the administration of company doctrine. And our staff can consult with you on creating successful usage of online marketing techniques, bringing you success through the search engines and enhancing your approaches to the web. Their creative staff can create viral marketing campaigns to help your organization to garner desired attention. Additionally, THEY improv can use newer grass-roots approaches such as Social Media powerhouses Facebook, Twitter and YouTube, and guerrilla marketing techniques such as street teams or publicity stunts to assist you to find newer clients. Throughout the Lone Star State, from Fortune 500 companies to small businesses, THEY improv helps firms meet their goals of laughter. 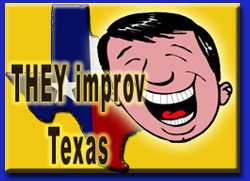 THEY improv is proud to serve Austin, the Dallas Fort Worth Metroplex (including Arlington, Grapevine, Plano, Midlothian and Irving), San Antonio, Houston (including Galveston, Conroe, The Woodlands, Sugar Land, Spring and Katy), Bryan / College Station, Waco, Corpus Christi, El Paso and the Rio Grande Valley (including South Padre Island, Harlingen, Brownsville and McAllen).